This updated Batman costume is so much sexier than the 1950's version! 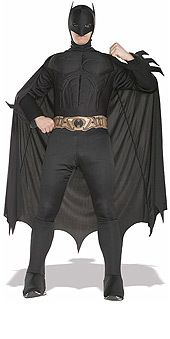 It comes complete with a muscle chest jumpsuit, attached boot tops, cape, headpiece and belt. What more could you want? Except maybe a damsel in distress to rescue, but I'm afraid you'll have to provide your own. Available in extra large size only.